Michelle – will you please reply with your blog URL? I’m guessing it’s the WordPress/BlogSpot hassle, but I cannot link to you by clicking on your gravatar or name, and the URL I had written down for you isn’t correct either! Still trying to organize my A to Z contacts! Thanks. That really is a unique beginning. Congratulations on reaching the big 25. You could turn this story into a movie, two Bobs, two Daves and a wedding :). Oscar material for sure. Thanks for visiting; I always enjoy hearing from you! What a sweet story! Happy anniversary! Love the double Bobs and the double Daves. What are the odds? Oh wait, I could calculate them…don’t really feel like it though. Beautiful bride, Sammy. Thanks, Tina. I seem to have more than my share of “name vignettes” in my stockpile of personal stories. You high school sweethearts who stay together for the long haul have my deepest respect and admiration. I wish our society made YOU the celebrities and role models. Happy Anniversary! You both look beautiful. What a great idea. Someday (maybe soon) your post will inspire me to share my more conventional (and as a result nightmarish) nuptial tales. My husband wanted to do it just as in a tropical location, but I insisted on having relatives present. Oh boy! We joke that everyone but us had fun. But, again, congrats. 25 years. That’s huge! Ha Ha i’m glad it’s you and not me with your tale – and “I do” want to hear it soon!!! My husband and I will have 22 in August so we are just a few years behind you. Again congrats, and thanks for sharing your story and your beautiful photos! I like your new Gravatar. Are those being packed for Paris?? Indeed. I’m sure that I can find the occasion to share those moments from time to time :-). Thanks re: Gravatar. No, sadly those will be staying home, and I must be “plus pratique” when we go, because I am taking only one carry-on size bag for 4 weeks in France. Crazy, n’est-ce pas? Nah, you’re a seasoned traveler. I laugh at having the same outfit in every picture but I travel light and comfy! What a perfect wedding! 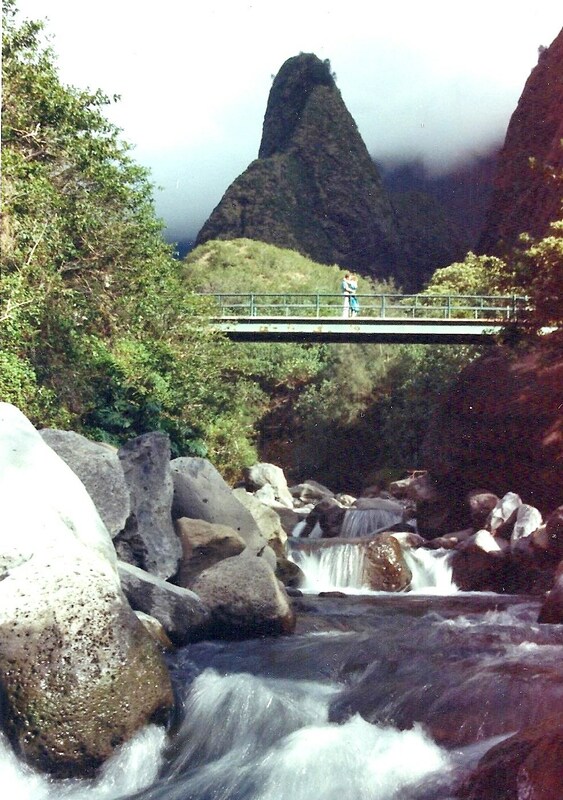 My husband and I did the same thing, minus the tropical Hawaiian setting; we went to Vegas, just the two of us, and got married in jeans and t-shirts, much to the chagrin of the officiant, who was moved to lecture us for twenty minutes about the gravity of what we were undertaking. She clearly didn’t think we stood much chance of staying married for long, but it’s been twelve years now and we’re still best friends and the happiest couple I know. Anyway, same basic theory, but nothing like your degree of romance. Happy anniversary to you, and thank you for sharing your sweet, sweet story. I love that, Melinda! Being true to yourselves. I cannot believe she had the audacity to lecture you ( I bet she was just jealous). Thanks–we both had much more traditional weddings the first time around and we both found that a big fancy wedding did not a happy, successful marriage make. Yeah, those “trainer” marriages and divorces teach us tough lessons about ourselves. I think of that when we so badly want to keep adult kids from bad choices – we made it through our “trials by fire” and they will, too. I couldn’t do the “big” wedding the first time around either – my little hippy self got married in my mini paisley dress with two witnesses!! LOVE this! Happy day to you! Happy Anniversary! Sounds like the perfect wedding to me! Hubby and I will celebrate our 35th in June:) Guess I need to scan some of those old photos into the computer for an anniversary post! Thanks for sharing…loved it! Thank you, Kat and congratulations on your long marriage. Definitely write an anniversary post. We need all the joy we can get floating around the world! Thank you, Carrie. Congrats back at ya! It is a real milestone and I wasn’t sure I was capable of “long haul” but I definitely picked the guy who could make it happen. Cool wedding! And many congratulations on reaching the silver – have a happy day both! Great story, Sammy. Congratulations on your big day — 25 years is a wonderful number. My husband and I just celebrated our 18th . Best of luck and many, many more. Thank you so much, Silvia. I love hearing about other happy marriages. I don’t know how to stop the years from going by so quickly! Happy Anniversary Sammy. I loved your story ….along with the two Daves and the two Bobs. What a truly magnificent wedding. You looked gorgeous. Marci – thank you so much. I replied earlier, but it seems to have disappeared! We are both lucky to have such terrific Hubs 🙂 Hearing about happy marriages strengthens my own. ;-). Thank you for stopping by, Suzanne. I do wonder if Honeymoon Dave and his wife are still together and celebrated their 25th a few days ago. It would be great if they are! Hi Conlee – thanks for stopping by and leaving your thoughts 🙂 I will swing by on my road trip to see what you’re writing about! Your story is similar to both of my sisters’, who also married in the islands. One sister’s vacation with long-time beau and my parents spontaneously turned into a “what the hell why not” wedding (they just celebrated year 17) and the other had just 7 family members in a tiny church, but my mom ended up inviting the minister and his wife, the church organist and his wife, the woman who did all of our hair/makeup and her boyfriend, and a kid I had met at the hotel and been hanging out with to the dinner after the ceremony. It was weird/fun! That marriage hits year 35 next month. Happy Anniversary dear one! We ran off and got married alone as well. We called some retired friends to see if they would be witnesses, asked them what they were doing that day. Their reply was, we are sitting around doing nothing, counting the hours till we can leave tonight for the plane to our cruise; everything is packed, everything is cleaned, so we are doing nothing to mess it up; absolutely we will meet you there. To make a long story short, they dropped by when they returned from Mexico several weeks later, and had made one of the photo books with pics they took from their phone. In the front we where the wedding party was listed, she was one witness, and he was listed as everything else – including the flower girl. It is a treasure to remember as your Dave and Bob are. Big hugs! What a beautiful wedding, photos, and a wonderful post. Thanks for sharing, Sammy. 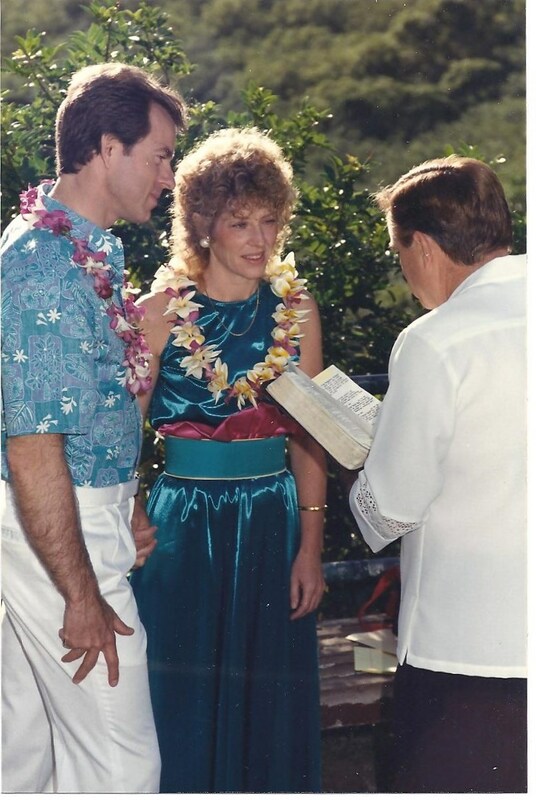 Happy (belated) Anniversary and congratulations on 25 years of wedded bliss! I love your wedding story! ♥ The whole concept is so romantic and the comic relief of two Bobs and two Daves added just the right note. What a gorgeous couple you make. 🙂 Here’s to many more years of happiness. Thank you, Debbie. I had to get married at dawn without time to get anxious about it 🙂 we do have a great marriage. Like yours is! Oh happy 25th wedding anniversary, how amazing and inspiring that you have been happily married for all those years. I’m coming up to 3 years and I hope that we will also make it all the way to silver and beyond! Your wedding sounds perfect, and I love the Bob, Bob, Dave, Dave connection. You couldn’t make that stuff up if you tried! Congratulations again, I hope you had a wonderful day celebrating such a happy occasion. Thank you, dear Celine. It’s funny because sometimes I still feel like it’s only been 3-4 years. I guess that’s a sign of a good marriage. You and your hubby have lots of rich adventures ahead of you 🙂 i’m excited for you. Oh that’s wonderful – I hope we think the same after 25 years! And thank you, I am excited to see what the future brings. In fact today is our anniversary – so our weddings were quite close to each other! Thank you, Jen, for your visit and well wishes. We had a lot of fun “winging it” on our weddin, and it’s fun to retell, too :-). I hope you have a great weekend. Thank you, Lynn, for such a sweet message. 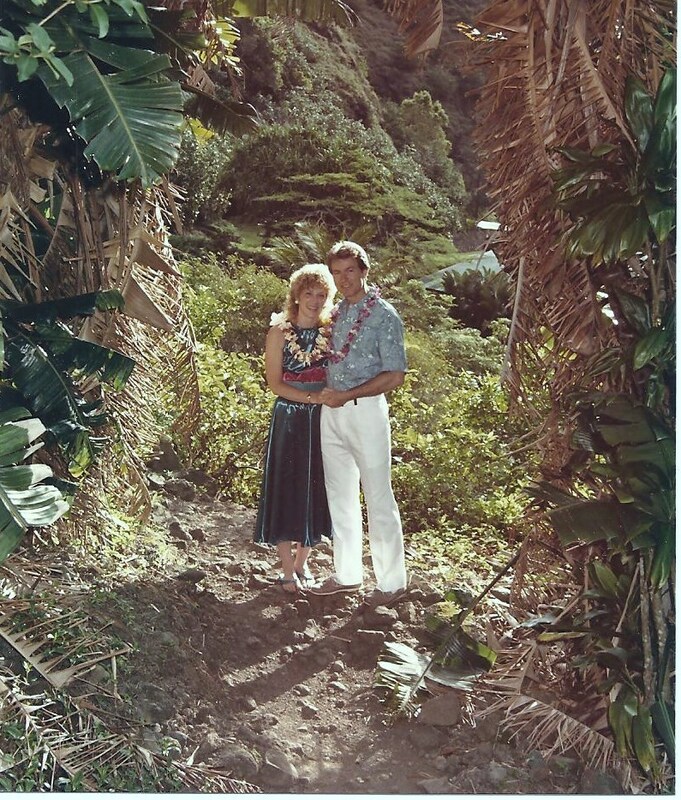 I know you will hsve a wonderful time on Maui celebrating your own joyful marriage.